The Southampton Spitfires Rugby League Football Club was founded in the summer of 2007 by Yorkshireman Glenn Tyreman and a group of Rugby League enthusiasts based in Glenn's adopted home of Southampton. Glenn is a vastly experienced Rugby League coach having worked with the England Lionhearts and the South of England teams, as well as undertaking regular work with Super League outfit Harlequins R.L. Glenn's previous clubs include Kent Ravens and St Albans Centurions. In their first season the Spitfires played a single trial game against the Kent Ravens at Southampton Rugby Union Club's Test Playing Fields as an exercise to introduce the sport to potential players. The trial was a great success ending in a 56-16 triumph over their more established opponents and provided the springboard for the formation of a permanent club. In 2008 the Spitfires joined the London Merit League (development league) structure, where they played a total of 8 games, winning four and losing four. This return saw them finish third in the league table, from where they qualified for the end of season play-offs. The Spitfires went on to beat South London Storm at home before being knocked out (26-16) in the semi final by West London Sharks, the competition's eventual winners. In 2008 the Spitfire's squad produced no less than six South of England representatives, three of which progressed to the England Lionhearts squad to face the Irish Wolfhounds, representing a fantastic progression within the game for this group of players. With two very short seasons under their belts the Spitfires stepped up to the more competitive Cooperative Rugby League Conference, where they completed in the South East division. At the start of 2009 the Spitfires entered the Cheltenham 9's finishing a respectable 6th out of 12 with one win (over Cheshire based side Lymm) and two defeats. Their final pre-season friendly saw them go down 32-12 away to Guildford Giants, in which the team sported their new-look playing kit launched with a photo shoot at Solent Sky aviation museum earlier that same day. Southampton Spitfires established themselves within the Rugby League Conference South East division and achieved a top three, play-off qualifying, finish to the campaign reaching the divisional Grand Final where they lost to Greenwich Admirals. The 2010 season saw the Spitfires move to Netley's Station Road ground to the east of the city where again they finish third in the table but in an expanded division featuring new club Sussex Merlins. The season ended in a narrow play-off semi final defeat away to Guildford Giants. 2011 was all about club expansion when the club launched a women's side which played a run of friendlies as a build up to joining the league in 2012. A junior section was also launched, again playing friedlies ahead of joining a league in the 2012 season. Additionally the club ran a men's second team for the first time, however there was a lack of regular opposition to play against and squad depth across the first and second team was severely tested. The reserves won two of their six friendly fixtures. The men's first team finished fourth in the league being knocked out of the play-offs away at Elmbridge Eagles. 2012 was the year that the club set new standards on all fronts. 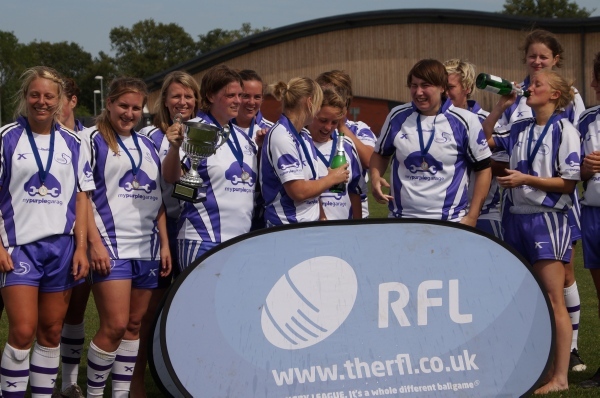 The women's team won their league and Grand Final at the first time of asking, gaining the club fantastic exposure in the process. And although the club didn't run a reserve grade expansion came through the junior ranks with under 10's skills sessions, under 12's and under 14's rugby taking place. The club also begun work on providing wheelchair rugby league. The men's first team finished second in the league behind Hampshire rivals Portsmouth who they met in the Grand Final, going down by a single converted try in what was easily the highest quality game the club had ever been involved in uo to that point. The long term aspiration is to expand the club into a valued community organisation providing the opportunity for upward progression within the club's age ranges and playing structure. As the club grows we aim to achieve and maintain governing body standards such as Clubmark and child safety accreditations. We will strive to uphold the values of the RFL's Respect campaign whilst maintaining good practice in all areas of the organisation. Above all we intend to become a valued part of our local and wider community. Why is the club called the Spitfires? The Spitfire aircraft is synonymous with the city of Southampton and the surrounding area, having taken off on its first ever test flight from Eastleigh Aerodrome at what is now Southampton Airport in 1936. The name Spitfire was suggested for R.J. Mitchell's fighter plane prototype by Sir Robert MacLean, director of Vickers-Armstrong's at the time, who called his daughter Ann "a little spitfire". The word itself dates from Elizabethan times and refers to - a particularly fiery, ferocious or competitive person ...a bit like a Rugby League player! In Southampton production was carried out over twenty-eight locations and employed approximately 3,000 people. During the Blitz of September 1940 Southampton received extensive bombing. The Supermarine factories were hit several times, badly damaging the Itchen and Woolston works, with the loss of over one hundred lives. After the Blitz devastation, the company moved out of Southampton to a country mansion near Winchester at Hursley Park. The control centre of the Spitfire programme was located at the mansion for the duration of the war, but the legend was born here and you can still see one of these fantastic aircraft in the city today at the aviation museum. There are a few sporting and cultural references to the Spitfire in and around Southampton most notably Eastleigh Football Club whose nickname is 'The Spitfires' and there is a replica Spitfire at the entrance to Southampton Airport. There are also plans for a Spitfire memorial.